Welcome to our review of the Nikon Bolt XR Crossbow Scope. This black matte non-illuminated crossbow scope is waterproof, shockproof, and fogproof. Read on to see how well it performs in the archery field. This scope is 8.1′ long and less than 2 inches in diameter at the widest point, making the scope about the same size as most included scopes. It weighs in at 11.2 ounces, so it will add close to a pound to your crossbow’s overall weight. How Much Magnification Do I Get From the Nikon Bolt XR? The Nikon Bolt XR Crossbow scope offers 3x magnification, allowing you to zero in on your target from up to 60 yards away. The BDC 60 reticle provides precise aiming points out to 60 yards. The parallax setting of this scope is set to 20 yards. How is the Optics Quality on the Nikon Bolt XR Crossbow Scope? The optics on the Nikon Bolt XR Crossbow Scope are crisp and clear, and you can easily see your clear target even beyond 60 yards. I’ve harvested deer using this scope out to 72 yards, and the deer was as clear in the scope as if he was right in front of me. The fogproof and weatherproof design of the Nikon Bolt XR makes the scope very nice to use in poor weather conditions, like when it is quite cold. I’ve never had to treat the optics with any fogproof coating, and still my scope stays clear of any fogginess. The scope provides 3.4 inches of eye relief, and the eyepiece is quick-focusing with +/- 4 diopter adjustment. This scope lacks illuminated reticles, but it transmits up to 92% of the available light for brightness and contrast. 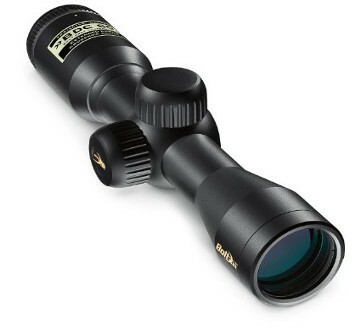 I wouldn’t recommend using this scope in very dark conditions, but it is more than adequate for use at normal hunting hours, like right after dusk. What Else Should I Know About the Nikon Bolt XR Optics? This is a fantastic scope, don’t get me wrong, but there is one area that the scope really lacks: the reticle itself. Instead of reticle lines, Nikon has used dots in the BDC 60 reticle. These dots would be fine if they were illuminated or otherwise easier to see, but they are very difficult to see under regular shooting conditions. You will probably get used to them in time (I did), but it’s worth noting. Nikon advertises the field of view as 35.6 at 100 yards, and I’d say that is pretty accurate. I can easily focus in on a large space of the landscape from my normal 60 yard shooting range, making it easy to zero in on a target quickly and easily. Unfortunately, the Nikon Bolt XR Scope does not include scope rings, so if you don’t have those’you’ll have to buy them extra. This is a disappointment, but not a deal-breaker, since the rings from other scopes will work just fine for the Bolt XR. Once you have the rings, the scope mounts in seconds, leaving you ready to sight in and test your accuracy. As long as your crossbow shoots at less than 350 FPS, the Bolt XR is extremely easy to sight in. The zero-reset turret adjustments make it easy to remember your sight-in point, since you can just lift the spring-loaded adjustment knob and rotate it to your ‘zero.’ The scope is shockproof, and holds zero for months on end without any problems. The only drawback to sighting in this scope comes if your crossbow shoots faster than 350 FPS. The scope was designed for 305 FPS, but stays relatively true out to 350 FPS. Beyond that, you’ll have to mentally adjust your range according to the BDC 60 reticles, since they won’t be exactly 30, 40, 50, and 60 yards for your crossbow. How Durable is the Bolt XR? This particular model is waterproof, shockproof, fogproof, and is just in general darned near indestructible under normal use and abuse. I wouldn’t recommend dropping the scope from a tree stand, but it should hold up to regular bumps and jostles without any problems. The Nikon Bolt XR Crossbow is an excellent crossbow scope, and definitely an upgrade over most included scopes. It holds zero well, has fantastic light-gathering capabilities, and features clear, crisp, fogproof optics. Unfortunately, the one drawback is the lack of reticle lines, which can make the scope difficult to use until you get really used to it.